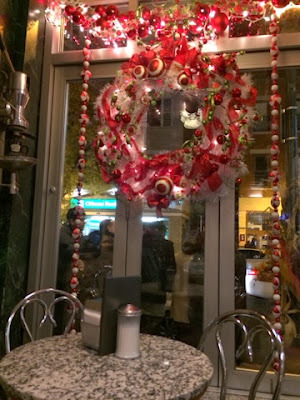 Caffe Vittoria in Boston's historic North End is a legendary spot for dessert and a warm drink. 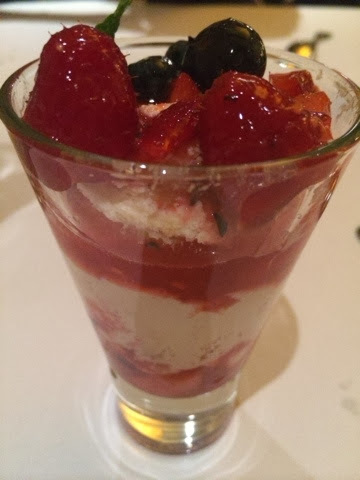 There's nothing better than going for a hearty meal and then stopping by Caffee Vittoria for dessert. They have all of the Italian favorites. There are canollis, eclairs, ricotta pie, Italian cookies, flan, chocolate ganache and so many more delicious treats. 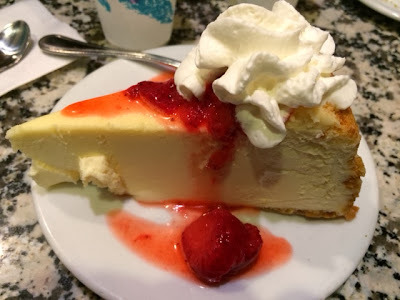 Their cheesecake is absolutely amazing. 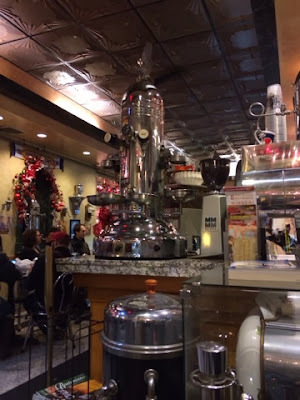 Caffe Vittoria also offers many dessert martinis and hot specialty coffee drinks. The service here is also so fast and friendly, but be sure to stop at the A.T.M. first. Caffe Vittoria is cash only. 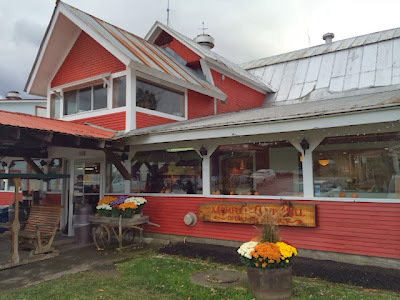 If there was ever a place that screams fall in New England, the Cold Hollow Cider Mill in Waterbury, Vermont certainly is it. As soon as you drive in, you'll notice the lush, green Vermont mountains in the background. When you walk inside, you'll have trouble deciding on what to look at first. Cold Hollow has all of the fall favorites. Of course, there is their apple cider. 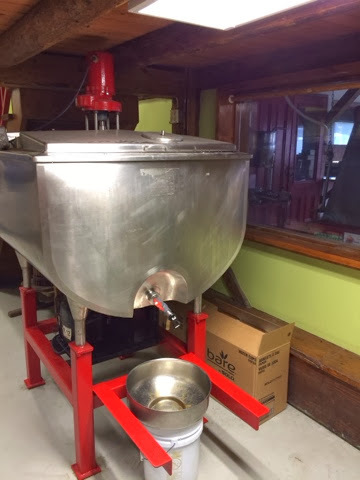 They squeeze it fresh on sight and if you're lucky, you'll be able to see them doing it when you visit. It comes in several different sizes and you can always help yourself to a free cup.They also sell hot cider by the cup. You've also got to try their fresh apple cider donuts. 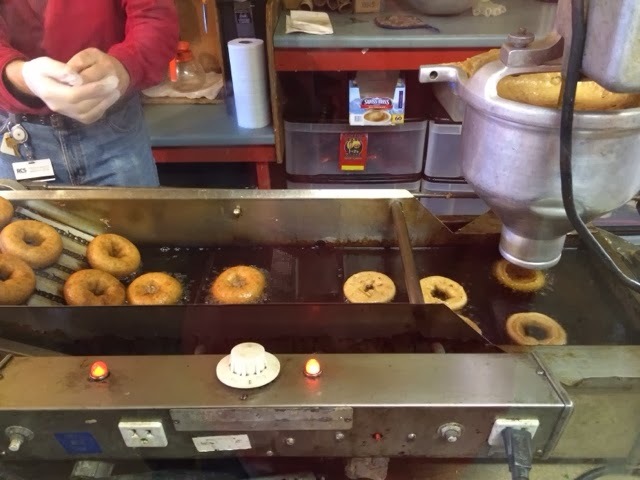 You can watch them make the donuts the old-fashioned way and then take some to go. Good luck eating just one! Cold Hollow also sells all kinds of cooking supplies and Vermont food products. 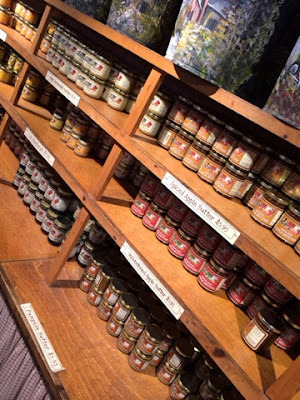 They have fruits & veggies, cookies, pancakes mixes, cheese, fudge, jelly, syrup and all kinds of jelly. They also carry several kinds of honey. 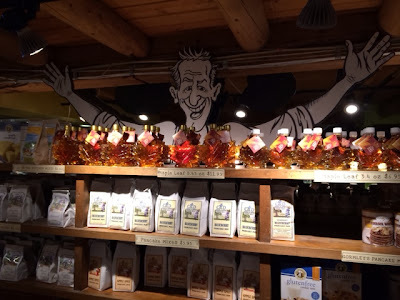 Don't leave without seeing Cold Hollow's honey comb with live bees! Christmas is coming and Cold Hollow sells and makes gift packs with their products and ships them anywhere. Check out this long list of Connecticut Thanksgiving dining options from CTNOW.COM. 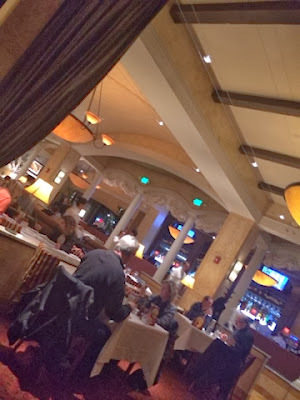 King's - (Dedham, Lynnfield, Boston) - "Keep Calm and Gobble On" Thanksgiving night event. Opening at 6pm on Turkey Day. Also open all day on Black Friday and offering deals on gift cards. Check out The Providence Journal's extensive list of Thanksgiving Day dining options. 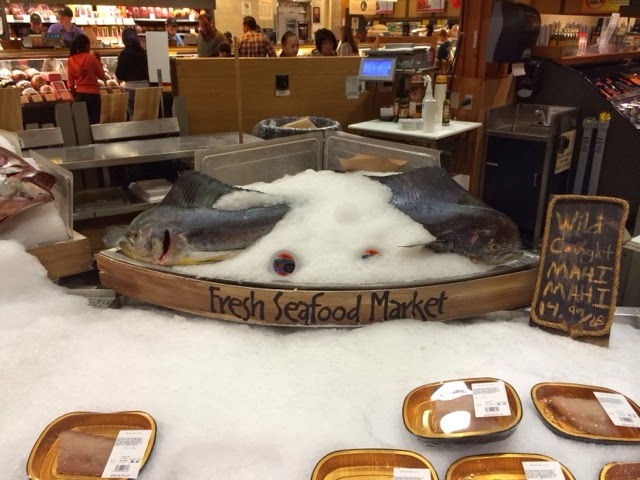 A giant fish on display in the seafood section. A train circles the daity department. There's a definite buzz around the Wegmans chain of stores. 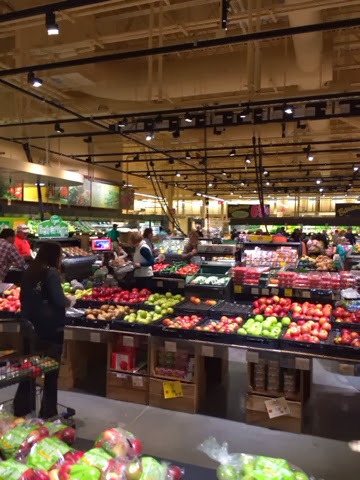 This grocery store on steroids started in Rochester, New York and is making its way to New England. 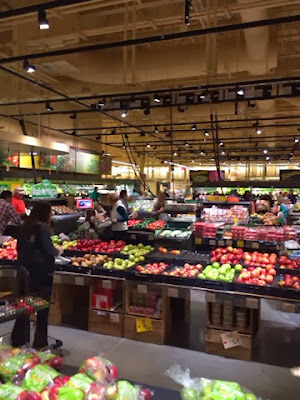 Wegman's is coming to Chestnut Hill soon, but is already open in Northboro, Massachusetts. You really could spend hours here. The place is huge and their are all kinds of specialty departments within the store. There's an Asian bar with chefs preparing sushi. The seafood department features live lobsters and huge fish on ice. 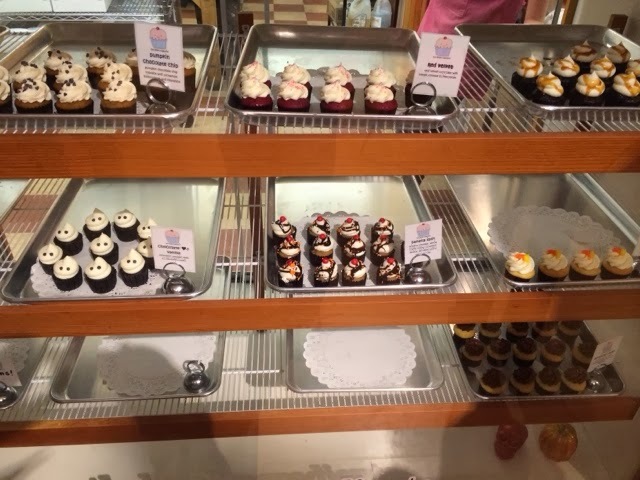 The cake and pastry sections have a wide selection of sweets. They even have a huge display of pumpkin cakes, cupcakes and pumpkin pie. 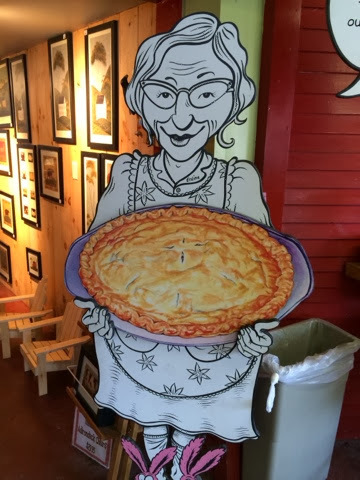 It was hard to resist the pumpkin pie! 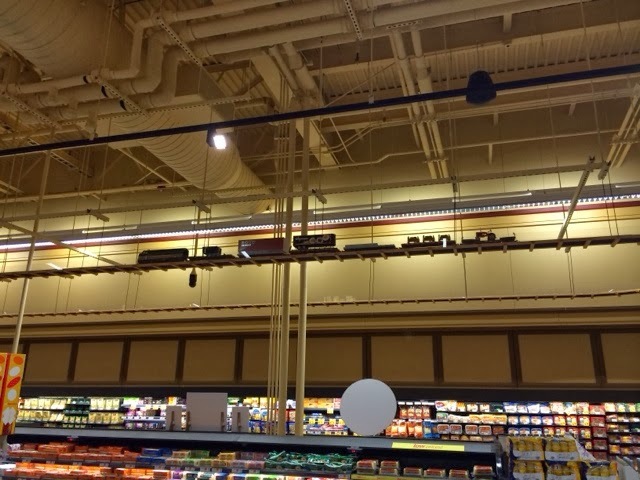 There are several aisles of health food and gluten-free items. 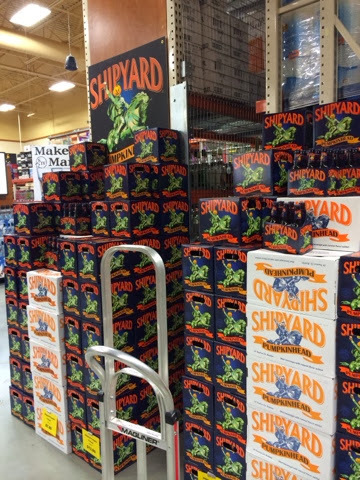 The beer and wine department is enormous and I was happy to see they were selling one of my favorites, Shipyard Pumpkinhead. Wegmans even has its own little restaurants within the store. There's a coffee shop, a sandwich shop and pizza shop. They also have a huge buffet and salad bar area with hot and cold items. 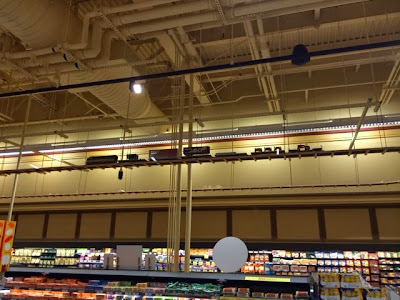 Wegman's was hopping, but there was plenty of staff to keep things moving. 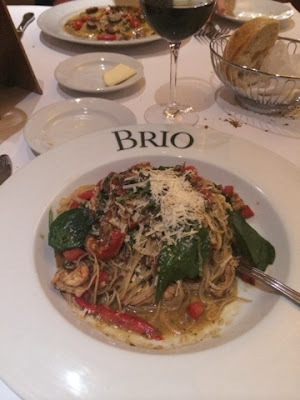 BRIO TUSCAN GRILLE OPENS IN CHESTNUT HILL, MASS. Brio Tuscan Grille is officially open in Chestnut Hill, Massachusetts. The place was abuzz with activity during its opening last night and I was happy to be there on the first night. There's nothing like an opening. There was an excitement in the air, staff from other restaurants were training and the place was sparkling. 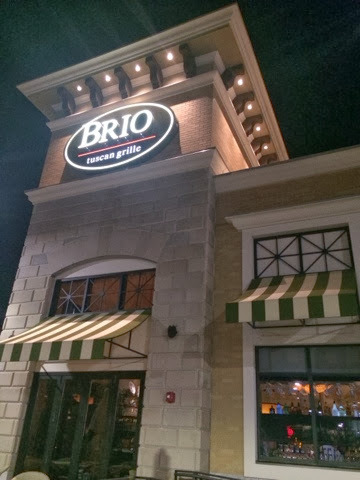 You should always give restaurants some time to perfect things, but based on what I experienced last night, Brio is ready already a well-oiled machine. Brio is one of the few places were I order wine. They big you a big ole' glass and it's priced right. So, I started with a glass of Merlot. They have great apps. I always have their bistecca salad, which is half a head of iceberg lettuce, Gorgonzola cheese, tomatoes and bacon. It's served ice cold with a steak knife for cutting into it. Wicked good. I also enjoy their tomato and mozzarella caprese. For the main course, I tried their "pasta pesto," with angel hair, grilled chicken, onions tomatoes and peppers. Delicious. They have many pasta entrees. I can also recommend their "campenelle carbonera," but be sure to bring your appetite, its a big dish! Other menu options include a variety of flatbreads, steaks and seafood dishes. One of the things that I really like about Brio is their dessert options. It's impossible not to order a dessert because the waiters always bring a tray out to tempt you. They have regular-sized sweets, but I always go for one of their "dolchinos," a smaller portion of their bigger desserts. I love their cheesecake dolchino and went for it last night. They are only $2.99 and worth every penny. Brio is located in the new Chestnut Hill Square development. 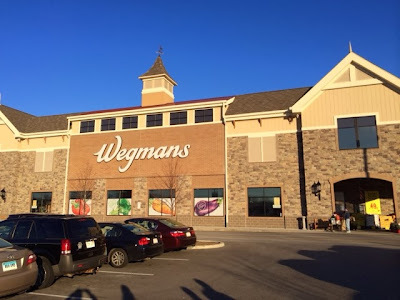 Be sure to check it out before the new Wegman's opens because by then, the parking lot with be a disaster. Go ahead. Try to look at this sandwich without drooling. 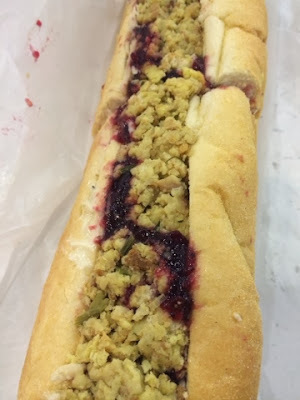 You're looking at "The Bobbie" and you can only find it at Capriotti's Sandwich Shop. I've told you about this sandwich before. This delicious dish is one of the reasons I started Eat Up New England. When you eat something like this, you've got to share the experience with others! So, what makes The Bobbie so special? This sandwich is packed with a very generous portion of homemade turkey. 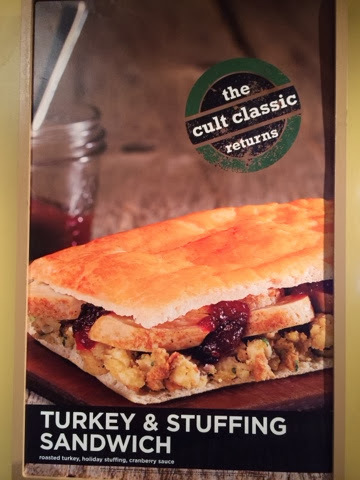 It's topped off with an equally generous portion of stuffing. Oh yeah, there's the cranberry sauce and mayo, too. It's the perfect combination of flavors. 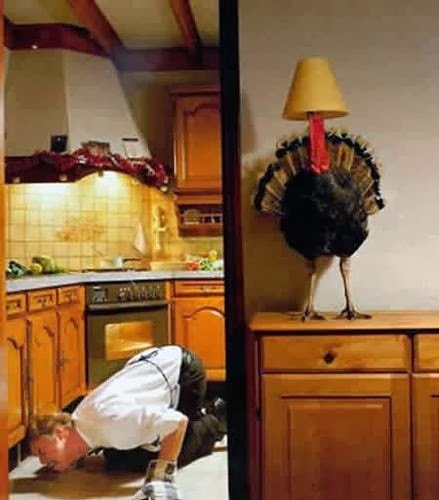 Be sure to try it this Thanksgiving. If you can't make it to Capriotti's over the next two weeks, don't worry! The Bobbie is available all year long. 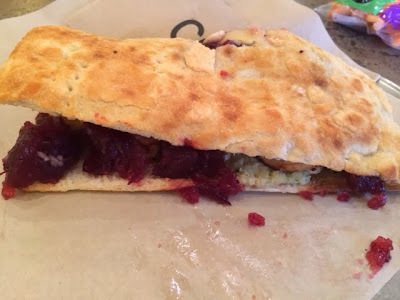 Capriotti's has a location in Foxboro, Massachusetts at Patriot Place and will soon be open in Mansfield, Massachusetts. While you're there, go for turkey overload and try their turkey soup. Like The Bobbie, it's packed with their delicious hand-carved turkey. Big cupcakes smothered with frosting can sometime be too much. 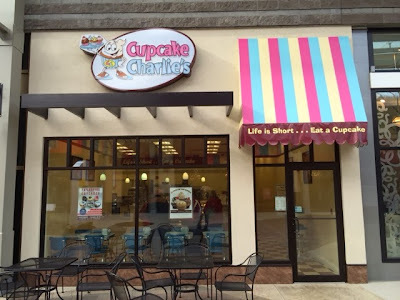 That's where My Little Cupcake in Burlington and Essex, Vermont comes in. They specialize in small cupcakes. This makes it much easier to sample their long list of flavors. 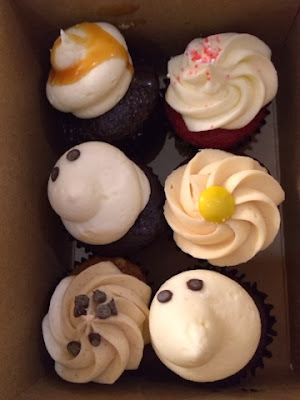 We got a half dozen, including some cute ghost cupcakes for Halloween and they are delicious. My Little Cupcake really does have every kind of cupcake imaginable. There are the standards like chocolate, vanilla, carrot cake and cookies and cream. Walk on the wild side with some more exotic flavors like Vermont maple walnut, s'mores, pumpkin chocolate chip, blueberry pancake and margarita. Check out their website to see pics of all of their cupcakes and read more about their flavors. If you're really hungry, My Little Cupcake also sells big cupcakes. Many of them have fillings. They also have coffee and hot apple cider to warm you up on these cold fall days. Business is booming at the new Cupcake Charlie's at Patriot Place in Foxboro, Massachusetts. When I was there yesterday, the line was out the door. Fortunately, the wait time wasn't long. I went for a more traditional chocolate cupcake with vanilla frosting. Very good. They also sell many cupcakes with fillings like raspberry and chocolate. 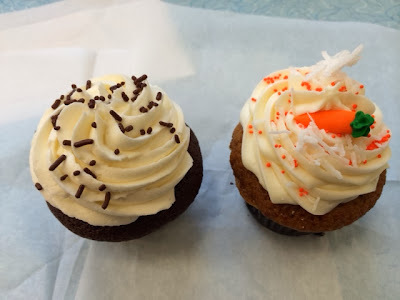 Their cupcake of the month is pumpkin pie and looks hearty enough to eat as a meal. If you're looking for an easy Thanksgiving dessert, Cupcake Charlie's is also taking orders for Thanksgiving cupcakes. 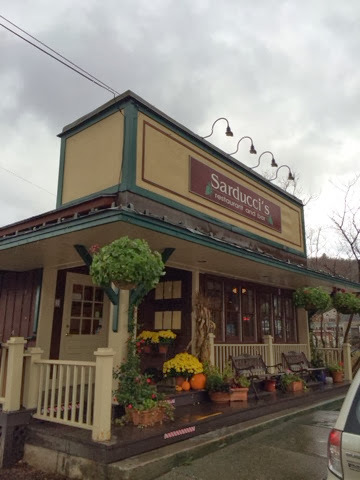 If you ever have your fill of Cabot cheese, syrup and pancakes in Vermont, head to Sarducci's in Montpelier for some classic Italian food. They have all of the traditional favorites and use a wood burning over to really bring out the flavor. Start your meal with one of their salads. We went for the "mixta" with greens, black olives, tomatoes. You can choose from my two favorite dressings: creamy Italian or bleu cheese. Other salads include Caesar, Greek, spinach and apple & hazelnut. Lunch and dinner meals include pizza, pasta and panini. There so many pastas on the menu. Go for the traditional. 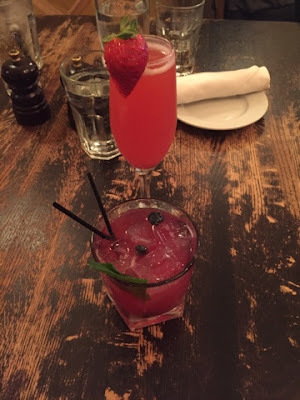 They have penne bolognese and fettuccine alfredo or try their crab ravioli with shrimp or their "Capellini di Verdure," angel hair with spinach, sun-dried tomato, olives, artichokes and goat cheese. I enjoyed one of their "Pasta al Forno" dishes. These pastas are cooked in their wood oven. The penne with scallops and shrimp was sooo good. It's actually made with a cheese sauce instead of tomato sauce. 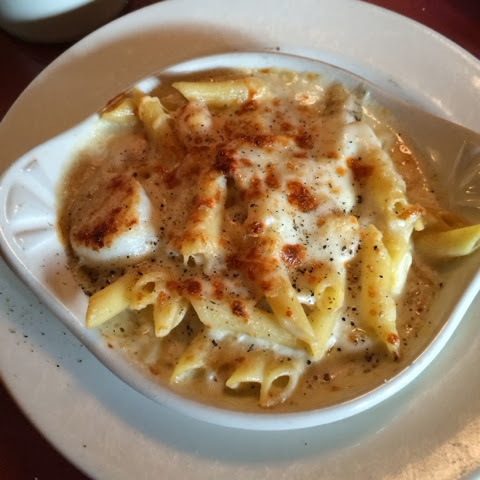 Other oven menu items include baked sausage, mac & cheese and chicken breast over penne. If you're in the mood for a pizza, they have many pies on the menu. There's the "Roma," a carnivore's delight with bacon, sausage, pepperoni or go for the "Il Fungo," a veggie lover's dream with roasted portobello mushrooms, blue cheese, mozzarella, and parmesan cheese. Sarducci's has many vegetarian meals and gluten-free options. And yes, they have a full bar! 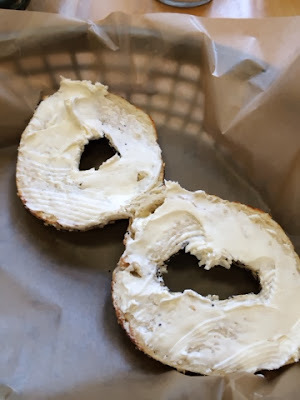 Drive too fast and you might just miss Myer's Bagels in Burlington, Vermont. 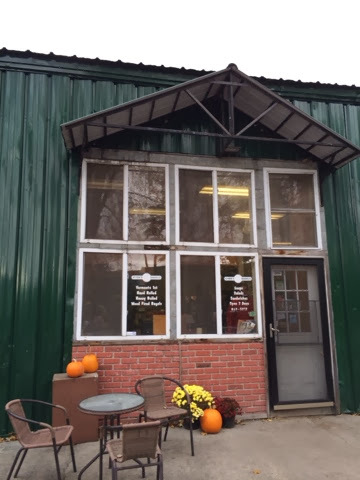 This bagel shop is as unassuming as it gets, tucked in off of the road and advertised only by a small sign. Myer's doesn't really need any advertising. 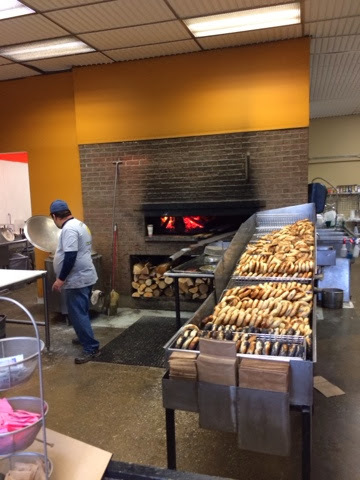 All of the locals and visitors know all about their Montreal-style bagels. So, what is a Montreal-style bagel? Walk right in the front door of Myer's and you'll find out. Montreal-style bagels are always baked in a wood-fired oven. You'll see it and feel the warmth from the oven right away. They are also handmade. You'll see workers hand rolling these bad boys before they are put into the oven. Myer's offers all of the traditional bagel flavors and then some. A bagel and schmear is just two bucks. They also offer breakfast sandwiches, hash and fruit yogurt. Stop by for lunch and you'll find a variety of Vermont inspired sandwiches like "The Causeway," with curry chicken salad lettuce and tomato, and the "Groovy UV," with hummus, cucumber, onion, lettuce, tomato and sprouts. They also offer a few salads and soups. Order whatever you want, but be sure to try one of their bagels!